With so many suit and tuxedo designers out there, it can be an overwhelming process to find a brand that accommodates both your unique taste as well as your budget. 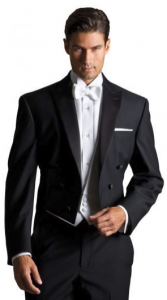 The reality is when shopping for designer tuxedos you can splurge on a suit that will set you back hundreds of dollars or more without gaining much in terms of style and fit. The right designer will offer the highest quality material while also providing formal wear that won’t break the bank. Savvi has done just that with the Savvi Evening Collection suits and tuxedos, offering an eye-catching selection of sleek and stylish looks fit for any occasion at an affordable price you’ll appreciate. Below we’ll spotlight a few of the signature looks that are part of the Savvi Evening Collection, perfect for the modern man who needs a suit or tuxedo for the important occasions in his life. For your go-to basic black tux, look no further than the Black Milano by Savvi Evening Collection. But don’t be fooled, this look is anything but ordinary. The jacket is crafted with a modern fit, so it will hug close to the body creating a sleek, lean line that flatters all body types. The jacket features a one button closure for ease of wear, and side vented back for added ventilation to keep you cool no matter what time of year you’re sporting this one of a kind look. The besom pockets and pick stitch notch lapels are adorned with a subtle satin for a touch of added flare. The Black Milano is designed from a special comfort wool, giving you the flow you need to stay out on the dance floor for hours whether at prom, work function, or wedding. This Savvi Evening Collection staple is available in both adult and children’s sizes, ensuring you can keep this timeless piece a part of your wardrobe for years to come. For those that wish to depart from your basic black tuxedo, Savvi Evening Collection has just the attention-grabbing look. As one of the most unique mens designer suits, the Grey Cutaway tux will have you turning heads left and right… in a good way. The most eye-catching feature of the Grey Cutaway are t black hickory stripe pants that offer a subtle yet ultra-sophisticated pattern for those that wish to stand out from the crowd with their formal wear. The outfit is complete with a classic fit jacket designed with self-faced peak lapels and side vented back for your comfort and ease of movement. Crafted from a special comfort wool, the Grey Cutaway by Savvi Evening Collection is perfect for year-round wear. Because true style knows no age limits, the Grey Cutaway is available in both adult and child sizes. For truly special occasions, we recommend completing your look with a grey vest, tie, and pocket square. Savvi Evening Collection is recognized and loved for the truly bold designs for men who like to break the mold. The Black Peak Full Dress is a signature look in the Collection that demonstrates the right way to dress to the nines for the most important days in a man’s life. This incredibly slick black tuxedo features a classic fit jacket complete with a six button front for an unexpected yet totally sophisticated look. The back of the jacket is just as special, fashioned with a tailcoat back for added drama and formality. The peak lapels are finished with a luxurious satin, taking the entire look to the next level. The Black Peak Full Dress, a favorite among the Savvi Evening Collection, is finished off with sleek and simple black flat front pants. Made from Savvi Evening Collection’s signature comfort wool, the Black Peak Full Dress is breathable, comfortable, and ready for long wear. Rounding out the Savvi Evening Collection is the Black Cutaway, an all-black version of the Cutaway for a more traditional look. The classic fit jacket is designed with your comfort in mind, creating a shape that flatters the body without sacrificing room to move. The one button front closure allows for ease of wear, and the besom pockets and self-faced peak lapel offer high style and sophistication. 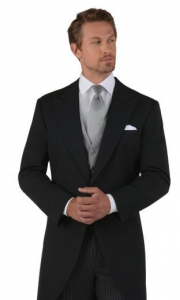 With a non-vented back, you’ll enjoy the sleek, clean lines this tux creates for your body. Whether at a formal work event, wedding, prom, or other special occasion. Like most all looks in the Savvi Evening Collection, the Black Cutaway is created from comfort wool ensuring you’re always comfortable even out on the dance floor. 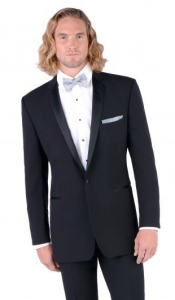 Savvi Evening Collection tuxedos and suits make shopping for formal wear a breeze. Each suit and tuxedo that is part of the collection has been crafted with your comfort and style in mind, offering the most in quality and fit to flatter your body and provide a look that rivals even the most expensive designer tuxedos available on the market today. Whether you’re drawn to the classic, modern look of the Black Milano, want to stand out with a pop of pattern with the Black or Grey Cutaways, or prefer the head to toe elegance of the Black Peak Full Dress, the Savvi Evening Collection has something for everyone.